On Saturday, January 26, the Hult Center for the Performing Arts proudly welcomes JOJO ABOT to the WOW Hall. Originally from Ghana but currently based out of New York City, JOJO ABOT is a genre bending artist using film, dance, painting, fashion, and of course, music, to express herself and her message. 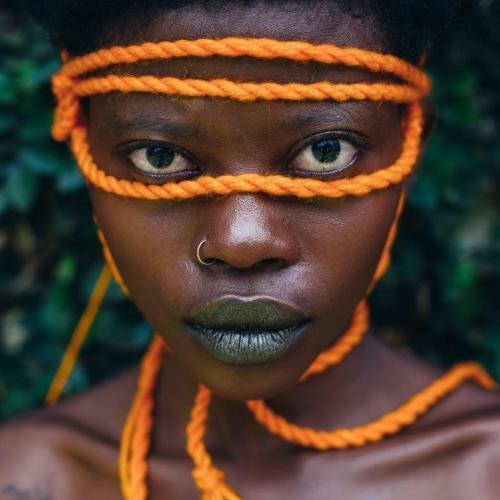 While JOJO ABOT will be performing here at the end of the month, Eugenians will have the opportunity to experience her work earlier in January at the Hult Center, where she will be presenting her immersive new project titled POWER TO THE GOD WITHIN. POWER TO THE GOD WITHIN is an artistic experience that presents the Black being as divine and all-powerful. The show premiered earlier this year at the National Sawdust in New York City. Throughout creating her show, JOJO ABOT has still maintained a steady touring presence, spending the last year on the road performing with artists including Ms. Lauryn Hill, Common and Stephen Marley. The versatility of JOJO ABOT can be heard within just a single song. Take her performance of her track “To Li” for the 2017 New Year’s Eve concert in New York. Wearing a large, middle parted yellow wig, and sporting colorful facial painting around her eyes, she begins by staring into the camera and delivering her opening lines --where she accuses her lover of touching another woman. In the song, sung in both English and Ewe, JOJO ABOT chirps to hit high sharp notes and bellows to deliver a powerful deep tone, inflecting notes with a growl every so often. Blending dancehouse, electronica, neo-soul, jazz and more, her music allows her to explore wide ranging themes such as racism, love, a woman’s right to choose and the divine feminine. As of now, Eugene is the only West Coast city where JOJO ABOT is scheduled to perform and show POWER TO THE GOD WITHIN. Rarely does the city get chosen to host such a unique artist. POWER TO THE GOD WITHIN will be shown at the Hult Center throughout the month of January. The WOW Hall will be her final show in Eugene. Come celebrate with a night to be remembered. Doors open at 7:00 pm and showtime is 8:00. Tickets start at $28 and are available through the Hult Center box office.